PRINCETON, NJ -- Nearly a year into the widespread implementation of the Common Core State Standards -- an initiative that specifies what U.S. public school students should know in English and math at each grade level -- 35% of public school parents have a positive impression of the new education framework and 28% have a negative impression. Thirty-seven percent haven't heard of it or don't know enough to say. Among those who say they have heard at least a little about the Common Core standards, views tilt positive, by 52% to 42%. 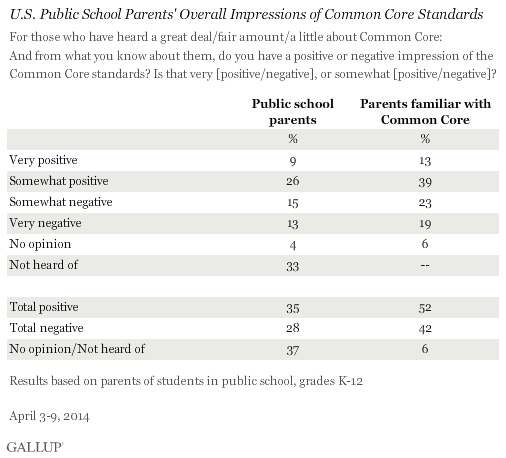 However, relatively few parents feel strongly about Common Core. Even among parents familiar with the standards, just 13% view them very positively, while slightly more -- 19% -- view them very negatively. These results are from Gallup Daily tracking April 3-9, and are based on interviews conducted with 639 parents, aged 18 and older, who have children in public school from kindergarten through high school. Forty-five states plus the District of Columbia initially signed on to the Common Core standards, which were developed by a consortium of governors and state education commissioners, and partially funded by The Bill and Melinda Gates Foundation. President Barack Obama has endorsed the standards, and states that adopt them are eligible for federal Race to the Top education grants. Thirty-three of the states, plus the District of Columbia, implemented the standards in or before the 2013-2014 school year, while 11 states are slated to start next fall. Indiana just became the first state to withdraw from the program, citing budgetary as well as substantive concerns. Some critics of Common Core have argued that the standards were crafted without sufficient involvement from parents, teachers, and local school boards, thus taking the public by surprise. In fact, fewer than four in 10 parents (38%) appear to be knowledgeable about the standards, saying they have heard either a great deal or a fair amount about them. Nearly as many -- 31% -- have heard nothing, while another 30% have heard only a little. Parents in states that have already implemented Common Core are only slightly more familiar with it than those in other states, and their overall views toward the standards are about the same. Even if public school parents are largely unfamiliar with the standards, they give positive ratings to the key Common Core components. Three in four parents (73%) say having one set of educational standards across the county for reading, writing, and math will be positive for education. Nearly two-thirds (65%) believe using standardized computer-based testing to measure all students' performance and progress will have a positive effect. And 67% believe linking teacher evaluations to their students' Common Core test scores will be positive. Additionally, at least twice as many parents say each component will be very positive for education as say it will be very negative. There has been ample opposition to Common Core on the political right and left. Some Republican governors and prominent conservatives have decried what they see as a loss of local control over curriculum. At the same time, some teacher groups, including the New York City teachers' union, have concerns about loss of teacher control over curriculum, as well as Common Core-aligned standards and tests that they consider educationally and developmentally inappropriate. When it comes to parents, however, the criticism mainly comes from the right. 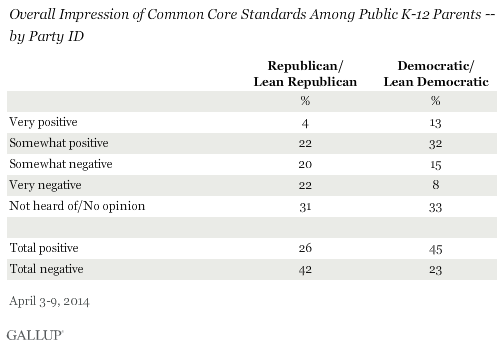 Among public school parents, 26% of those who are Republican or lean Republican have a positive impression of Common Core; 42% view it negatively. By contrast, 45% of Democratic and Democratic-leaning parents view Common Core positively, while 23% view it negatively. At the same time, the majority of Republican and Democratic parents, alike, believe each of the three main aspects of Common Core will be positive for education rather than negative. But Republicans are somewhat less positive than Democrats on each item. State leaders pushed for the development of the Common Core State Standards to ensure that all K-12 students are challenged to meet the same high educational standards needed for success in college and entry-level jobs. On one level, the program has been successful, achieving buy-in from 44 states. But there is still a long way to go, including full implementation of the standards, launching the testing component, and using the test scores to evaluate teachers and principals. Already, critics of the program are proving their muscle by slowing down or reversing implementation in some states; and if this were to reach critical mass, it could derail the whole enterprise. But whether the critics speak for parents, generally, seems in doubt. Parents play a critical role in their children's education, and their views about whether the Common Core standards and the associated curriculum and testing make sense are important. At this initial stage, parents' overall reaction is positive, though importantly, a substantial minority say they have never heard of the standards. 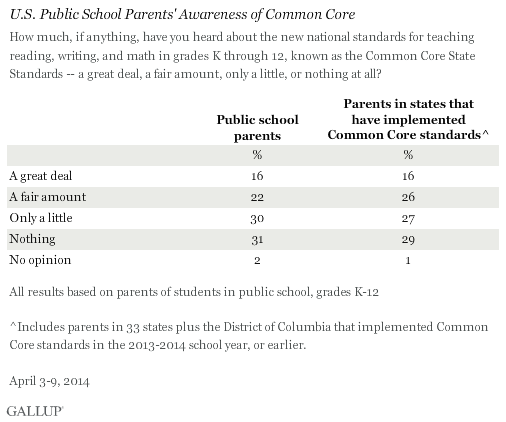 After more parents observe the effects of Common Core firsthand, their views could change. Regardless, because the standards will likely change the way many students are educated, it will be essential for school districts to clearly inform parents about the standards and any associated changes in expectations for students, so that parents can do their part in helping them adapt and succeed. Results for this Gallup poll are based on telephone interviews conducted April 3-9, 2014, on the Gallup Daily tracking survey, with a random sample of 639 public school K-12 parents, aged 18 and older, living in the 50 U.S. states and the District of Columbia. The margin of sampling error for results based on the total sample is ±5 percentage points at the 95% confidence level. For results based on the 466 K-12 public school parents who familiar with the Common Core standards, the margin of sampling error is ±6 percentage points at the 95% confidence level. For results based on the total sample of 382 parents living in the 33 states that have already implemented the Common Core standards, the margin of sampling error is ±7 percentage points at the 95% confidence level. Eighty-nine percent of Wyoming residents believe their local teachers are well-respected, the highest percentage in the U.S. In Nevada and Louisiana, slightly more than six in 10 residents say this about their teachers. In North Dakota, 87% of residents rate the quality of their state's public K-12 education as excellent or good, the highest ratings nationwide. The lowest ratings are in Nevada (42%) and New Mexico (41%). Americans' trust in the quality of online colleges and universities is rising, with 37% of U.S. adults now agreeing or strongly agreeing that these institutions offer high-quality education, up from 30% in 2011.